King's Fun Time | Affordable Bounce House Rentals | San Diego Jumper Rentals Company. Welcome To King's Fun Time! It is our goal to become your event partner. We want to help ensure that your event goes off as planned. Make King's Fun Time San Diego Bounce House Rentals part of your event team. Not only do we provide the rental equipment but we also provide a wide range of services to help meet all your needs. King's Fun Time is here to make your life easier! King's Fun Time was founded in 2013 with a singular goal of becoming the premier rental source for San Diego inflatable bounce houses, San Diego inflatable jumpers, Tents, Tables & Chairs in San Diego County. 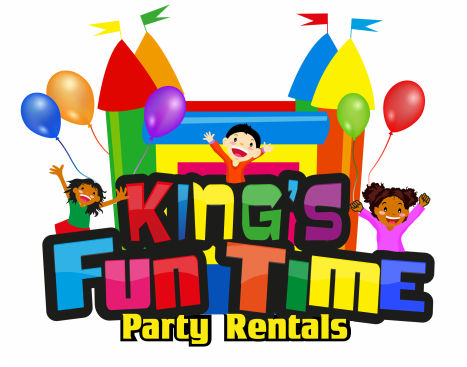 Having established a solid foundation based on integrity, professionalism, and superb customer service over the past several years, King's Fun Time has positioned itself among the leading party rental companies in all of San Diego. ​​King's Fun Time can help you out for any event. Weddings, formal events and birthday parties are just some of the events we cater to. KFT has you covered. Our friendly staff and seasoned San Diego Jumper Rentals personnel has years of experience in the service industry. They will help guarantee that your event is a memorable one. ​For those services that we don’t offer for your event or party, we can direct you to other local businesses. These businesses provide the high quality services your event may require. Kings Fun Time offers a variety of inflatable bouncers for your private parties or organization events. We also offer a number of traditional yard games and indoor games for your enjoyment. Give us a call and we’ll help you make your next party or gathering an AMAZING event! ﻿Fundraisers, backyard parties, business meetings and community events will be more fun when you rent concession equipment from Kings Fun Time. Not only do we have the right equipment, we offer all the concession supplies you need to make your next event delicious. King's Fun Time can provide chair rental for any size events. Let our experienced staff help you determine the style and quantity of chair that you should rent for your event, wedding or party. We have chair rentals to accommodate casual gatherings or parties of any size.